Inspired in QSTK, the eventprofiler module is a tool to analyze, statistically, how events affect future equity prices. The event profiler scans over historical data for a specified event and then calculates the impact of that event on the equity prices in the past and the future over a certain lookback period. The goal of this tool is to help you quickly validate an idea, before moving forward with the backtesting process. Returns the number of events occurred. Events that are on the boundary are skipped. Base class for event identification. You should subclass this to implement the event identification logic. Override (mandatory) to determine if an event took place in the last bar (bards[-1]). bards (pyalgotrade.dataseries.bards.BarDataSeries.) – The BarDataSeries for the given instrument. This class is responsible for scanning over historical data and analyzing returns before and after the events. predicate (Predicate.) – A Predicate subclass responsible for identifying events. lookBack (int.) – The number of bars before the event to analyze. Must be > 0.
lookForward (int.) – The number of bars after the event to analyze. Must be > 0. Returns the results of the analysis. Runs the analysis using the bars supplied by the feed. barFeed (pyalgotrade.barfeed.BarFeed.) – The bar feed to use to run the analysis. useAdjustedCloseForReturns (boolean.) – True if adjusted close values should be used to calculate returns. Plots the result of the analysis. The idea is to select a stock near the market open whose returns from their previous day’s lows to today’s open are lower that one standard deviation. The standard deviation is computed using the daily close-to-close returns of the last 90 days. These are the stocks that “gapped down”. This is narrowed down by requiring the open price to be higher than the 20-day moving average of the closing price. # Returns over the adjusted close values. # StdDev over those returns. # MA over the adjusted close values. Declaring a Predicate that implements the ‘Buy-on-Gap Model’ event identification. Loading bars for some stocks. 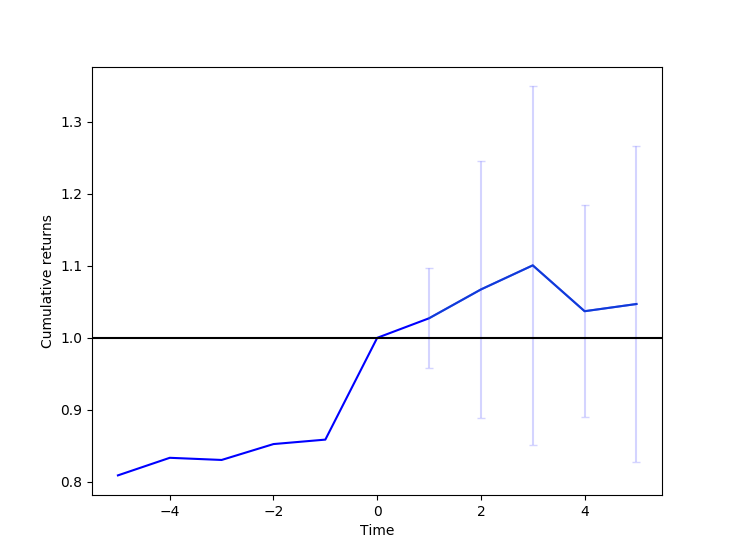 Note that Cummulative returns are normalized to the time of the event.